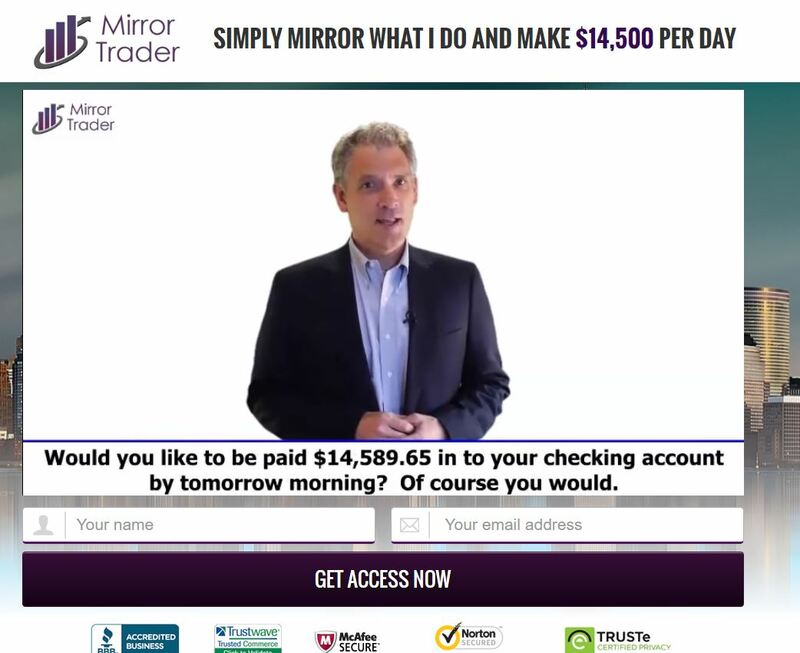 This review is about “Mirror Trader”, a new binary options scam presented by John Harrison. Harrison claims to be the CEO of Mirror Trader, which is a company that created a binary options trading software that is making $14,500 per day or $300,000 per month to its users. Trading with Mirror Trader is allegedly risk free and you need zero experience. So you can become a millionaire for free. Mirror Trader is a typical binary options scam. People who created it are affiliated with some unregulated brokers and will get paid for every depositor they can refer. And this is the only purpose of Mirror Trader, to make you deposit at least $250 with a selected broker. The trading software is absolutely worthless and will lose your deposit in trading, if you decide to join. John Harrison is a well-known binary options scammer. Well, to be exact, he is an actor who just plays different roles in binary options scams. Look at the picture, not so long ago he played the role of Dennis Moreland in the Push Money App scam. As you can see the Mirror Trader story is complete fiction. Everything you can see in the video is completely fake, testimonials are fake, trading account statements are fake, everything. On the Mirror Trader web site you can see some testimonials, but they are totally fake. Stolen photos were used together with some fictitious stories and results. Check the picture on the right to see where the photos were stolen from. The Mirror Trader software was created by scammers and cannot trade profitably. It is used in binary options scams only, it loses money to users, we have a lot of feedback about it. 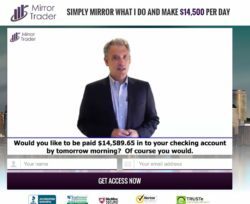 Mirror Trader is a very simple binary options scam. It is designed to make you deposit and lose money, so stay away from it. If you are interested in making real money in trading, you can try a free binary options demo account where you will see how it works and what you have to learn. And forget about free money making systems, they don’t exist.